The weekend of 17 and 18 May was one of the most amazing soaring weekends I have ever seen. I spent the entire day flying on Saturday, and didn't dare ask my wife to go out and have fun on Sunday immediately following Saturday's good flight. Instead, I spent the day with my wife and two youngest children at Skyline Soaring Club's away day. Once or twice a year, the club picks up all the gliders and flies them to Burner Field. While at Burner Field, the club members get to hang around in a relaxed atmosphere, watching all of the gliders fly in and out of a beautiful grass strip. Before Bill Burner bought the property that is now Burner field, we used to do this once-a-year away day at High View Farm, which you may recall was the turn-point I used for the Gold Distance Diamond Goal flight that I completed on Saturday. While we ate sausages and cookout food at Burner Field, an insidious theft was being performed. 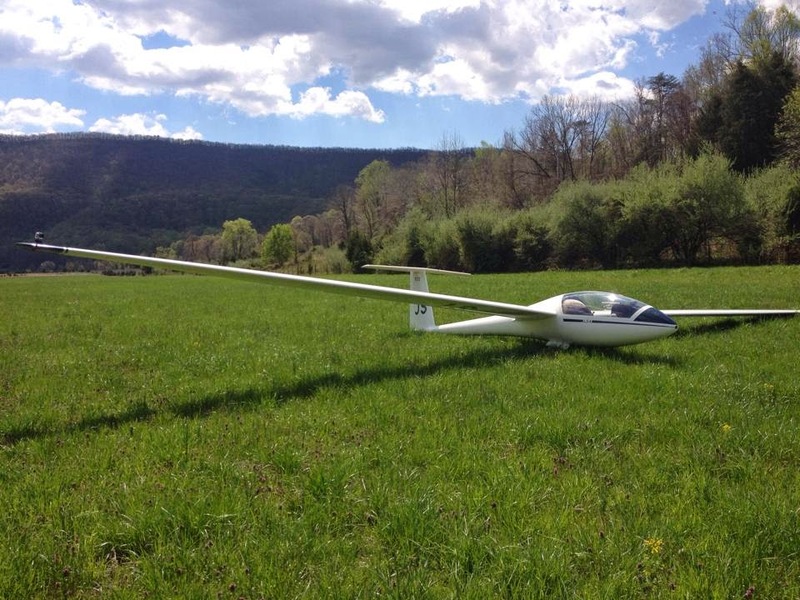 A member from the Blue Ridge Soaring Society snuck up the Allegheny mountains and landed their club's glider at Front Royal. His mission was to reclaim the coveted "Boomerang Trophy." The trophy sits in the clubhouse until a visiting glider pilot arrives to claim it. The visiting glider pilot must arrive by cross-country glider flight. The visiting glider pilot who shows up must have performed a flight of at least 100 km, (or 50 km if it's a lower-performance glider). If two different gliders show up on the same day, the one with the longer distance takes home the award. The trophy gets the visiting pilots name, date, and distance flown added to the list of names on the trophy. Another club now has the opportunity to get the trophy relocated to their clubhouse. This tradition has been going on since 1969. It has traded clubs 78 times until Sunday. The previous few flights were when our club's Shane Neitzey retrieved the boomerang from an incredibly long flight to Erwin, NC, covering 259 miles. Two members from Fairfield's M-ASA (Litt and Higgins) came down to steal the boomerang from us, and Shane promptly retrieved it a few weeks later. Sunday was JP's chance to return the Boomerang trophy to New Castle for the first time in ten years. When he landed at Front Royal, he looked around and probably wondered if he landed at the right airport. Where are all of the gliders? Little did he know that they were all at Burner Field, being flown by well-fed pilots who had consumed their fill of cookout food. A few Skyliners eventually arrived and welcomed him warmly while JP waited for his retrieval crew to arrive. 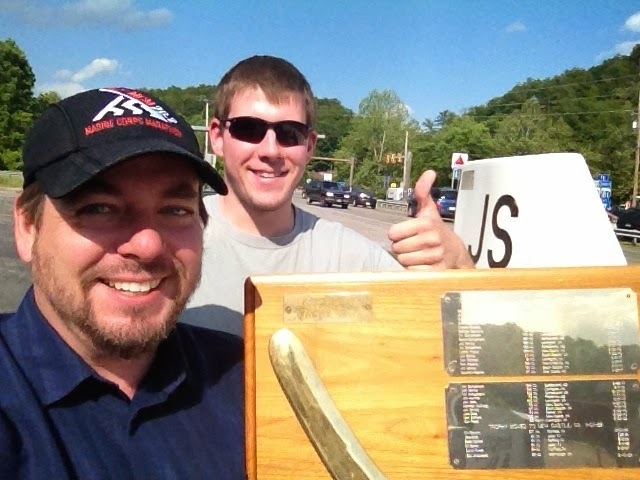 JP's crew showed up and packed up his club's LS-6 "X8" and took the Boomerang trophy with him. New Castle is located along a thoroughfare of ridge flying that stretches north all the way to Williamsport, Pennsylvania. It's not impossible or even improbable that an enterprising pilot from Julian Pennsylvania could fly down to New Castle and relocate the trophy well outside of our club's reach. The trophy has gone as far south as South Carolina in the past. The longer the trophy sits at New Castle, the more likely it will get relocated outside of our club's reach. Immediate action had to be taken. BRING BACK OUR BOOMERANG! Jp Stewart showed up from New Castle today, and whisked it back to the protective cocoon of mountains surrounding New Castle International. We need to assemble a recovery team to go get it back! (Just like how Shane Neitzey got it back from M-ASA last year). We can't let that trophy stay at New Castle, since it's "on the ridge" and could conceivably be relocated somewhere along the "main ridge" hundreds of miles away. Conversation soon followed, "You know, tomorrow [Monday] looks pretty good, just as good as Saturday and Sunday were." Once that idea was planted, we started to find pilots willing to stand up for the task of getting our Boomerang trophy back. But as Sunday evening got later and later, the volunteers started to dry up quickly, as realizations of the priorities of real life settled in. Pretty soon, I found only my tow pilot and my ground crew willing to go out to the airport on Monday to assist on my task of retrieving the Boomerang. The ball was in motion. I don't think the Boomerang had ever been retrieved on back-to-back days before, and we thought this would send a message to the other clubs in the surrounding areas. I got my manager to allow a short-notice leave of absence (due to me coming down with an acute case of avi-itis (pilots joke around that avi-itis is the inflammation of the aviation, known to pilots on good flying days that would otherwise be interrupted by work (It's good to have an understanding manager))). I arranged to have the tow pilot and ground crew at the airport around 10:00 or so on Monday morning. I checked the BAK40 plots one last time that morning, and agreed that Monday's soaring was going to be as good or better than Sunday's soaring. I hooked up the trailer to my ground crew, Bruce Zivic's truck. "It doesn't matter where I'm landing, there's just no way I'm landing back at this airport" I told Bruce. We waited for the thermal activity to begin. The start of the day showed nothing but deep blue skies. Doing a cross-country flight in a glider with clear-blue skies is rather difficult, and must be approached cautiously. Those days mean the glider pilot doesn't know exactly where the next lift is, and must approach the inter-thermal spaces in-between a little more cautiously. I knew the forecast expected there to be little white puffy clouds all over the mountains guiding me which way to go. The first little white puffy cloud started to form, and a few minutes later, I was underway behind the towplane. John Noss, tow pilot, took me straight to the only thermal in sight. John Noss -- my tow pilot -- took me to the lone white cloud in the sky, and I released 2700 feet above airport elevation in a moderately strong thermal. 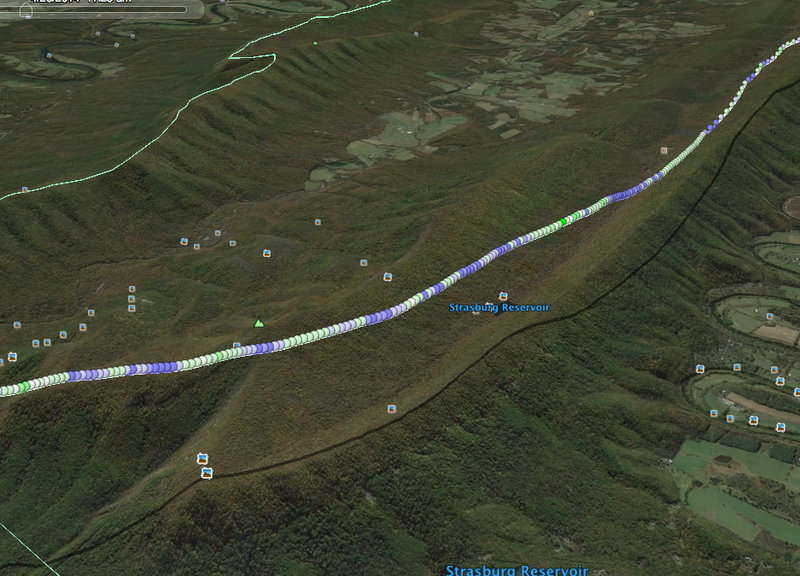 I circled in tight turns up to 5700 feet MSL, and started my southward journey along the Massanutten mountains. Like Saturday, the thermals were strong but not as great as I was expecting them to be. As I edged further south, the thermals got better, and the outlook showed that there was no thermal activity in the valleys, just over the mountains. When I got to the Massanutten ski resort, the clouds over the Blue Ridge mountains looked so much better than the Massanutten's clouds. I climbed as high as I could, and hopped over the valley to see if the lift was any better over the Blue Ridge mountains. It was here at the southern end of the Massanutten that I maxed out the thermal lift to the highest altitude that I could manage -- 8008 feet MSL. I felt like I needed every foot of altitude to make it across the valley, and not have to climb so much on the other end. It took 55 minutes for me from aero tow release to the southern end of the Massanutten, 36 miles away. I tiptoed across and found lift just as strong as I was expecting it. I flew straight and level, only slowing down while the lift was good, and only performing circling turns when the thermal showed more than 8 knots of lift. This is really easy flying. I just sort of bumped along from cloud to cloud, not losing much altitude between them, and keeping my altitude more or less the same as I followed the shape of the mountains. 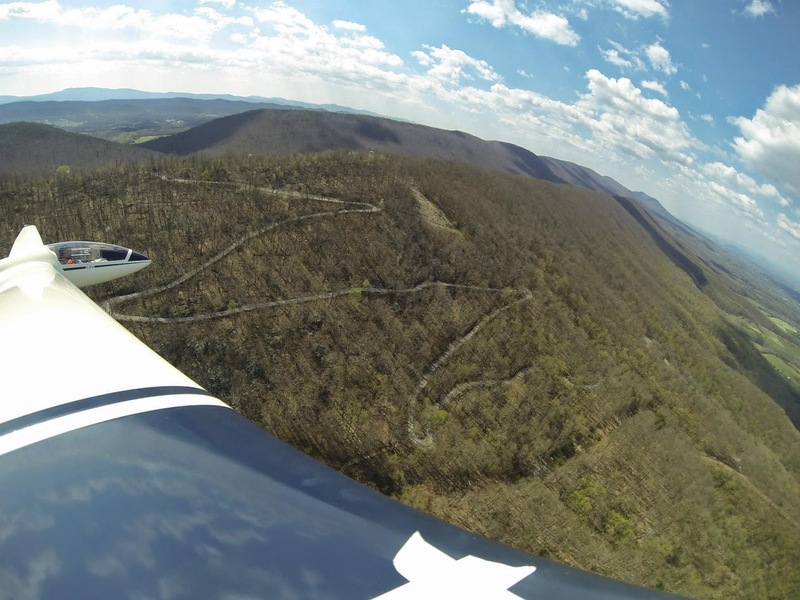 I've never flown a glider south of Waynesboro before, but I've heard the legends of how excellent the soaring is over the mountains to the south of Waynesboro. The legends were right. 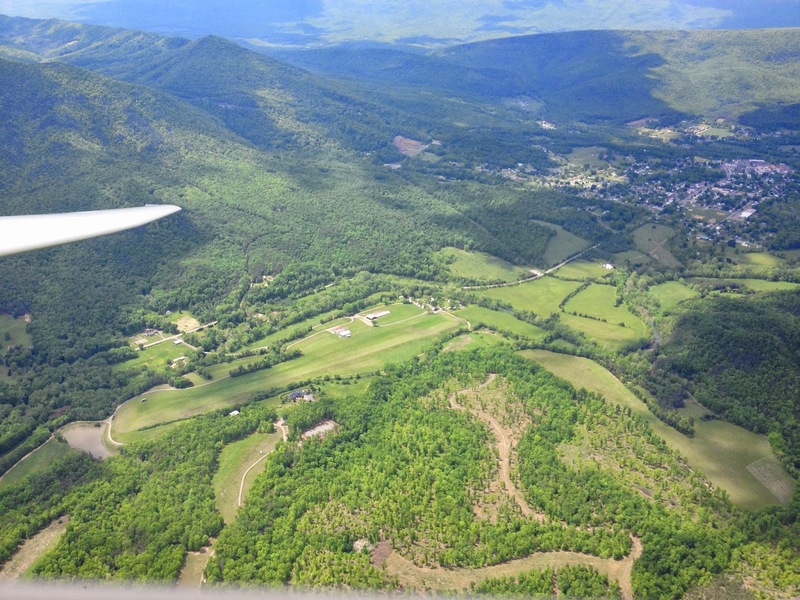 I flew over the Wintergreen golf course, located on top of the mountains there (cool!). I flew from cloud to cloud, and saw the Montebello VOR on a mountaintop to my right. After a certain point, I knew it was time to turn on the GPS and see how I was doing. I kept the radio and GPS turned off, because of my battery problems. I really wanted to have the flight computer available to me while flying over the unfamiliar terrain near Roanoke. Within 5 minutes of having the flight computer turned on, it started complaining about low battery voltage. How could this be? I've never had the battery act this badly before. I turned off the SN-10 flight computer, and continued to fly with my map and compass -- the old-school way of doing aviation! Before the flight computer complained of low voltage, I noted that New Castle was 54 miles away and at a heading of 244. "As far as I can tell, I think I'm right over this part, here"
Having never been this far south before, I started to get nervous and unsure of myself. This is also where the Cincinnati's sectional transitions from one side of the paper to the other. I found myself trying to fold and refold the sectional in my tight cramped cockpit, while flying. It wasn't until I started my trip across the Shenandoah valley to get to the Allegheny mountains that I orbited in a thermal until I could get this map thing sorted out. I compared the sectional's representation of I-81's shape with what I was seeing out the window. I could see where I-64 separated from I-81, and headed off into the mountains. I looked to my left and could clearly see the shape of Buena Vista, VA and Lexington, VA. I had it sorted out. Good news! I was exactly where I had thought I was at the time. As I crossed the Shenandoah again, I got to the Alleghenies, and followed Interstate-64 into the mountains. I found a very strong thermal there, and headed south under acceptably strong streets of thermals. I crossed over the mountains, and approached Clifton Forge, and the mountain right next to it, "Little Mountain" and "Waits Mountain." This was the one time I felt pretty desperate to work some thermal lift. There was a lack of well-defined clouds around here, and I looked to the fields below in case I had to land out onto one of them. There are three private airports on the ground in this valley, and some of the fields around the river seemed even more inviting than the private airports. After patiently crossing back and forth under the cloud, I finally found something useful, and climbed after 12 minutes of struggling to gain only 1300 feet. I didn't need any more thermals to get to New Castle. I had "the Bowl" in sight, and had the airport made pretty easily. I did come across the final strong thermal of the day, where a wide area of trees were felled in either a forest fire or a logging operation (not sure which). This was right where 606 and 615 formed an intersection. In any event, the bare dirt made for excellent thermalling, and it gave me the opportunity to take some good pictures of New Castle as I was circling down for a landing. Total flight time off aerotow to landing was 3 hours 19 minutes, with an average velocity of 78 km/h. I made an uneventful landing. There was a grass-cutting operation going on at the time, and the regular fixture at the airport, "Dale" passed by several times on the tractor as I took some selfies and posted to Facebook of my achievement. I don't often take selfies. But when I do, they make me look like an air pirate with an earring. The previous winner of the Boomerang trophy, JP Stewart, was in Roanoke engraving his name onto the trophy. He learned of my exploits from Facebook, and had contacted me to arrange the transfer of the trophy. In the meantime, I waited for Bruce to show up with the trailer, so we could take Juliet Sierra home. Bruce arrived 47 minutes after I landed. The route he took seemed to be a good idea when we looked at the map before my takeoff, but could have been a shorter drive if he had just gone down I-81, instead of taking the back roads. I don't know the exact route he took, but I'm sure it was an adventure! JP and I met up near Interstate 81 to hand over the trophy. He's a surpsingly good sport, considering the short turnaround time. The trophy had hardly one night in its home clubhouse. valiantly in defense of the trophy. On the long ride back to Front Royal, Bruce told me story after enjoyable story of his father's incredible life and exploits. He sounds like a heck of a guy! When I uploaded my flight to OLC that night, I finally found out why the battery died after only using 10 minutes of flight computer time. When I was at the Burner Field on Sunday, I carried the Nano along with me, in the event that I was going to fly one of the gliders there. 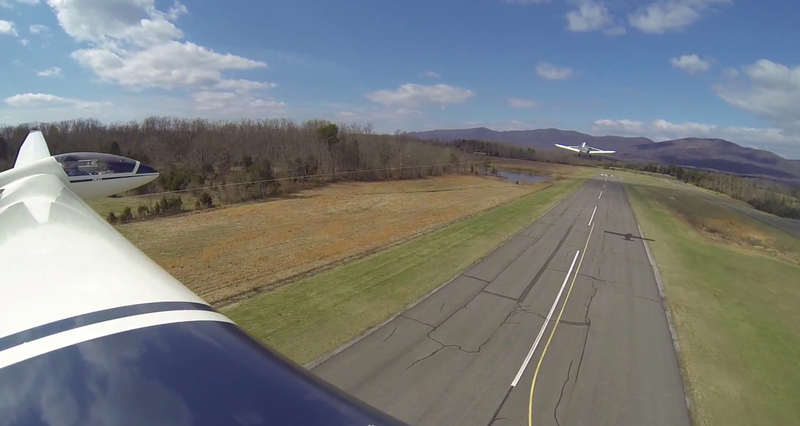 Apparently, the Nano got "pocket dialed" to turn on and start recording a flight. The Nano recorded the "flight" of me driving home (I also have solid incontrovertible proof that I didn't speed on the way home). I didn't realize this at the time, and I didn't realize this when I hooked up the Nano to the glider on the next morning in preparation for the flight. The Nano has a great internal battery that lasts 24 hours or more. It did a fabulous job of recording the GPS position of the hangar in which it resided overnight, and slowly drained battery power while doing so. When I uploaded the flight to OLC, the flight was more than 24 hours long, and started on the 18th of May, not the 19th of May. The IGC file reports battery voltage every hour or so, and after looking through the file, I could see the battery charge draining slowly. After being hooked up to the instrument panel, and the aircraft's electrical system, I could see the Nano's record of the battery charge increasing throughout the flight. That certainly explains why the aircraft battery drained faster than it usually does. I have taken the trophy to an engraver, who will polish the trophy, that is starting to look rather tarnished, like it hasn't been polished since it was made in 1969. The trophy will be finished on Wednesday, and returned to Front Royal on the weekend of the 1st of June. If anybody lands at Front Royal to claim it in the meantime, I will ship or deliver the trophy to the new winner. Super huge thanks go our to my retrieval crew Bruce Zivic and tow pilot John Noss. Without whom this day's victory could never have been accomplished. Also a huge thanks goes out to Shane Neitzey for inspiring me to go get that trophy back as quickly as it was taken. Finally, thanks goes out to JP Stewart, who came and got the trophy. Without the trophy going someplace else, it would just be sitting in our FBO, getting ever more tarnished and dusty. When it comes to merit badges, we soaring pilots are much like the Boy scouts. The FAI (Fédération Aéronautique Internationale) has different badges awarded for glider flights over certain distances, altitude gains and duration. The awards start out with the A, B, C badges -- usually awarded to pilots who have just soloed. Each badge increases its difficulty. The Bronze badge requires some flight instruction with an SSA instructor, a written test, and enough time fly gliders in solo flight. The Silver badge is awarded for a modest-distance flight of 50 kilometers, a modest altitude gain of 1000 meters, and a five hour solo flight. Most importantly, the Silver Distance award teaches the pilot how to properly document and apply for this award. I've failed the documentation for the Silver in so many different ways. The Gold Badge is more involved -- a 300 kilometer flight, and a 3000 meter gain in altitude. I succeeded in my 3000 meter altitude gain in 2006. Although I've been a glider pilot for 28 years, it has taken me a while to get up to the Gold Distance. One of the major obstacles holding me back was having never landed out. I solved that last month. I have most certainly performed gold distance flights before, but I have never declared it and executed it well enough to submit the paperwork for the award. This past Saturday, I finally achieved this milestone in my soaring career. Saturday looked to be an absolutely outstanding soaring day. A cold front had blown through, leaving all of the air aloft to be much cooler than the air below. Once the sun came out, the ground heated up just enough to make that warmer air rise skyward at about 10 miles an hour. The excellent soaring days are also the days when the weather on the ground is perfect, too. Any surface heating is quickly removed by a cool breeze. It didn't get too cool because the sun could occasionally peak through the clouds, warming up the surface for the next thermal. The day looked good enough that Joe, Chuck and I set out to accomplish our Gold Distance task. 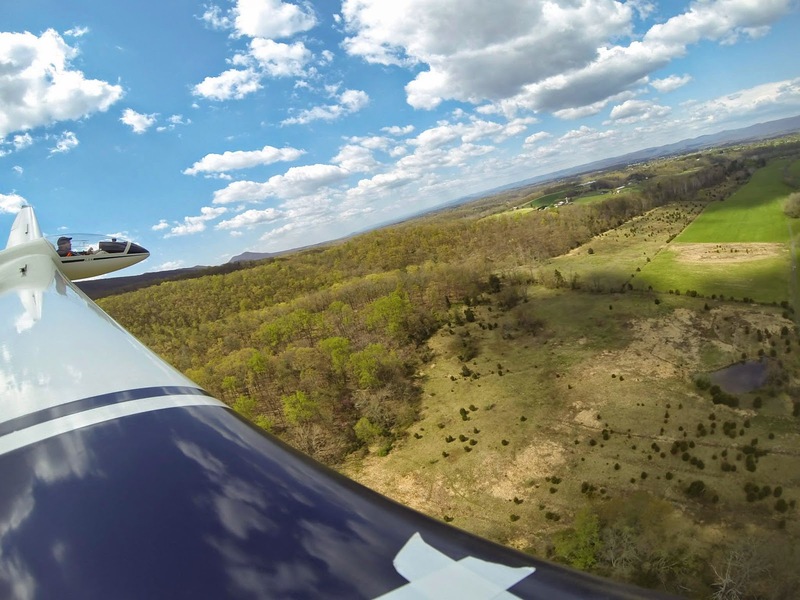 The two other guys decided to start at Signal Knob (just west of our airport) head 68 statute miles south to Waynesboro's glider airport "Eagle's Nest." 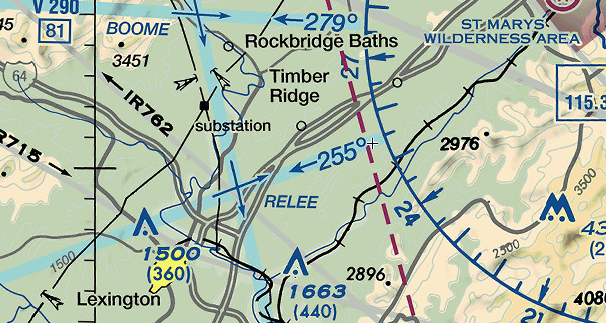 Their second turn-point was a small airport near Martinsburg, WV. Their final point on the triangle was a return to Signal Knob. My task was only slightly different. I declared a shorter task starting at Signal Knob, south to Waynesboro's Eagle's Nest, north to the West Virginia Border near Summit Point Raceway, at a small airfield named "High View Farm", and returning to Signal Knob. The other two guys set out first, and I had a launch 30 minutes behind them. The lift was strong enough that I didn't have to circle very often. I was not terribly impressed with the thermals on the Massanutten, and soon headed across the valley to the Blue Ridge mountains. Once on the Blue Ridge, the amount of lift available to me changed for the better. I could cruise comfortably without having to circle. I just bobbed along under the clouds, slowing down a bit more under the clouds, where the wide area of lift allowed me to gain modest amounts of altitude. Once the lift stopped, I pointed the nose down, and gained a little speed. In the soaring contests, there's an expression, "If you're turning, you're losing." A glider that spends less time circling in lift will generally have a better time around the course. I chose to maximize this type of flying as much as I could. I've been having battery endurance problems for the past year. I keep meaning to buy a new battery that doesn't die out by the middle of the flight. I could give you a laundry list of excuses about why I haven't done it yet. Never do I regret it more than when I'm flying, and the equipment on board starts complaining about the battery levels. There generally isn't enough juice in my on-board battery to handle the burden of flight computer, flight recorder and radio for more than a few hours. To prolong the battery life and make the flight computer available to me, I kept the radio turned off. On a good soaring day, the radio is full of chatter, mostly from the glider pilots out of Fairfield, PA.
Having the radio turned off didn't make much difference, as by the time I got to Waynesboro, the battery had depleted its charge enough to prevent me from using the flight computer at all. No matter, I know the way back, and I could always navigate with this paper map I had in the cockpit with me. The biggest drawback after the power failure is that I had to reference the flight instruments for all of the speed changes, lift changes, and I had to fly something on my instrument panel called "MacCready speed ring." The good news is that my flight recorder's power source is independent of the aircraft's battery, and will continue to record the flight's details every 5 seconds. I just don't have access to the GPS's information while the battery is in the red. I headed northbound along the Blue Ridge mountains. The other two pilots who were attempting the Gold Distance made the turn-point at Waynesboro at about the same time as me -- four minutes apart. Instead of taking the Blue Ridge on their northbound route, they chose to return to the Massanutten mountains. It was here that the strength of the Blue Ridge mountain chain was much better than the Massanutten. 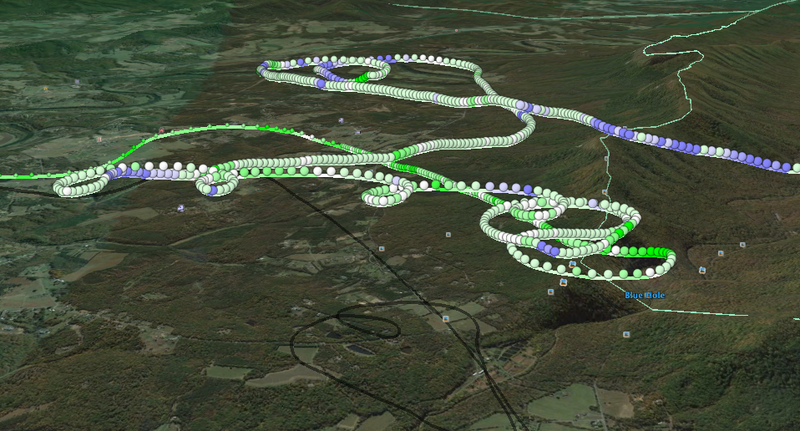 We were essentially neck-and-neck until the other two guys got to Luray, where their thermals got weaker. In the meantime, my thermals were so unbelievably strong that I was ignoring thermals with a mere 600 feet per minute, eschewing them for the 800 and 1000 feet per minute thermals. Joe hit what he described as "a wall of sink" and was forced to land his glider in a field 5 miles to the south of Front Royal's airport. Chuck managed to break free from the wall of sink, but was far behind me. He got to the West Virginia border 35 minutes after I did. I approached my turn-point at High View Farm. If you don't know where this field is ahead of time, it's nearly impossible to find from the air. 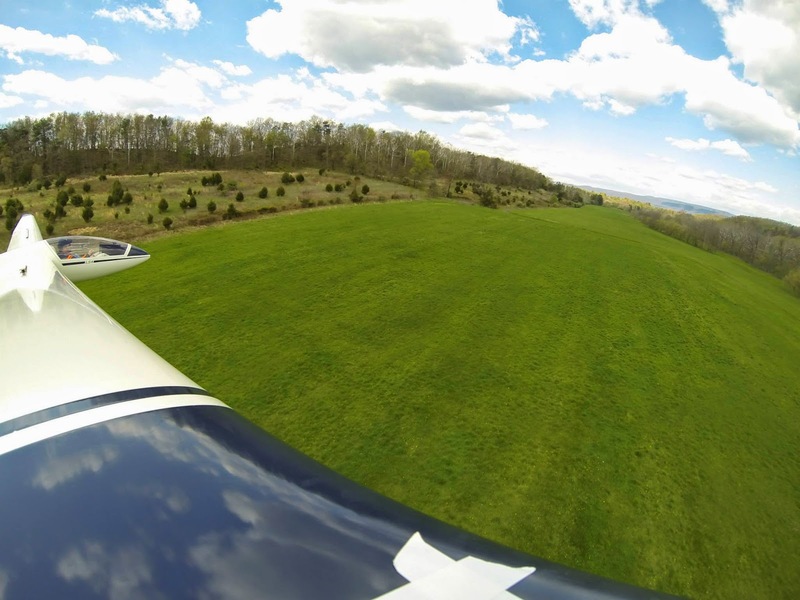 There are many better, longer, flatter fields immediately surrounding this small runway. 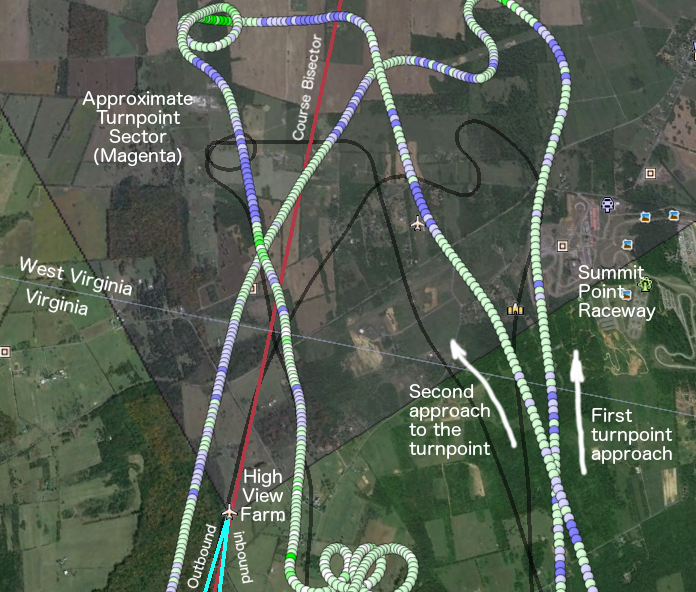 A few miles to the northwest of High View Farm is the Summit Point Raceway, which is a far better turn-point, much more obvious from the air. I made my turn, made a short video on my iPhone, and headed south. My task is running smoothly, and the lift has proven to be quite plentiful. I was aided by a tailwind on the northbound track, but found myself battling a 17 knot headwind, and less plentiful lift on the way to Signal Knob. It was still a great soaring day by almost any measure. For any FAI distance awards, a valid trip around the turn-point is judged relative to a turn sector. The turn sector is a 90 degree wedge opposite the incoming and outgoing courses. 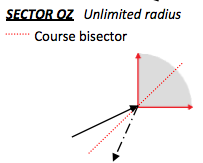 The diagram to the right (From the SSA) shows the definition of the turn sector relative to the course. As I headed south, I approached Winchester's airport. On the way, I started to wonder if my positioning relative to the turn-point was valid or not. This is the kind of nagging worry that you feel when you leave the house, and you're not quite sure if you turned off the oven or not. Did I remember to feed the cat? Did I put the milk away? Sometimes this obsession about fixing these things overwhelms you so badly that you have to turn the car around and go home to check that you turned off the oven, fed the cat and put the milk away. I approached the second turn-point twice. Rookie mistake! After further review, it was completely unnecessary. Since my flight computer was deactivated with a dead battery, the day was still pretty strong, and I wasn't that far from the turn-point, I turned back, and made double-sure that I had crossed into the right area around the airport. It's obvious now that I was well within the turn-point sector (shown as magenta lines above), but I really didn't want to discover that I was too far east of the sector after the flight. The second trip to the turn-point cost me time and average ground speed. Most importantly, the second approach to the turn-point meant that I would be fighting a headwind home with ever increasingly weaker thermals. The second southerly trip to the final turn-point left me really regretting the back-tracking to the second turn-point. The nice white puffy clouds that marked all of my thermals no longer looked as good as they did before the turnaround, and there was a huge distance to the closest thermal markers to the south. I tiptoed along at the most efficient speed, attempting to circle in any lift that was available along the way. I also knew that with the headwind and the weaker thermals that I would get blown further from my next waypoint. In other words, each time I stop to thermal in weak lift, I would be taking one step back after two steps forward. I finally made it to the city of Strasburg, VA, and performed a climb just high enough to comfortably get across the mountain, past my turn-point. After I landed, I found out that both Joe and Chuck had landed out. 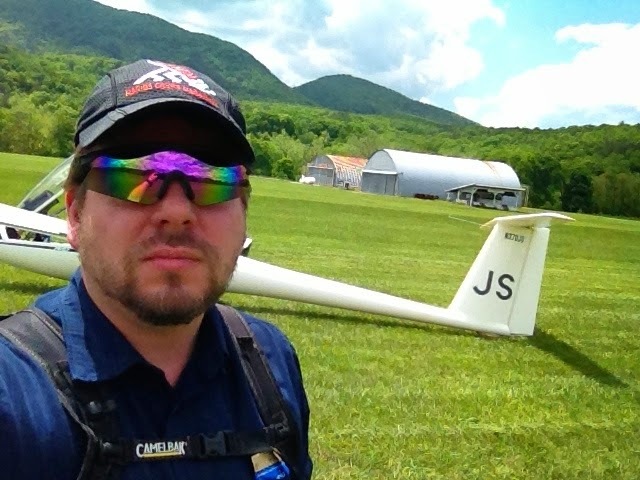 Chuck landed out at Martinsburg, WV, where the lift had gotten so weak that he couldn't gain any headway against the winds. I wonder if he would have found his Gold Distance flight if he had followed me along the Blue Ridge. The Award will be coming separately from the SSA office in the near future. You should see your flight listed in the August issue of Soaring Magazine. You will also find that the flight will be included in your member achievement record. 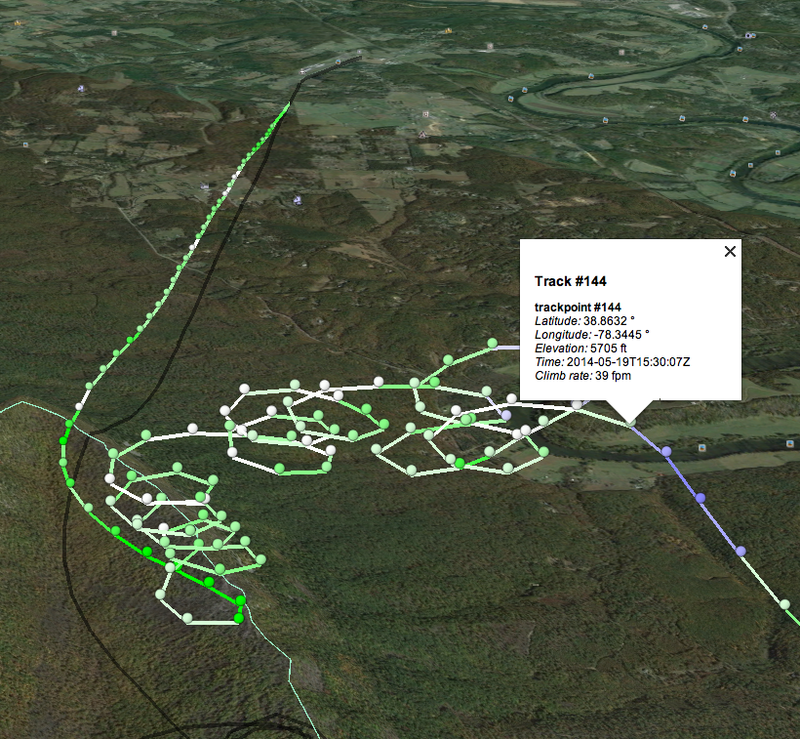 Here's my flight in OLC, and the Google Earth KMZ file that I created from the IGC file.